Arthur ‘Skippy’ Teasdale is an In- Pensioner at the Royal Hospital Chelsea. The Hospital is one of many organisations supported by The Soldiers’ Charity that provides specialised care for ageing and infirm veterans. Skippy joined the Air Force at the age of 17. Five years later he transferred to the Army and served in the Durham Light Infantry and in 1952 he deployed to Korea, where his unit lost 28 national servicemen, three of whom were never found. He says “As far as I’m concerned there’s no heroes here, the heroes we had we left behind”. After Korea, Skippy then went to operations on the Suez Canal. When he finally got home in 1957 he married his darling Vera but was soon posted to Cyprus so spent the first 12 months of his marriage abroad. He then left the Army and emigrated to Australia where he stayed for 44 years. When Vera sadly passed away Skippy vowed to move back to the UK. 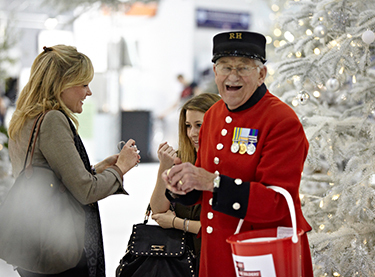 He moved into the Royal Hospital Chelsea in 2010 thus becoming a proud Chelsea Pensioner. The Royal Hospital was founded by King Charles II in 1682 as a retreat for veterans. It is now a retirement home and nursing home for some 300 retired British soldiers. Funding from The Soldiers’ Charity paid for part of the refurbishment of the Long Wards, otherwise known as the pensioners’ living quarters. We also give annual grants to pay for arts and crafts programmes so the Pensioners have indoor activities during winter, as well as funding towards the Pensioners’ respite breaks at the Kitchener Homes in Lowestoft. It's thanks to your generosity that we can continue to support veterans like Skippy and other Chelsea Pensioners at the Royal Hospital. Help us continue to be there for them by making a donation today.